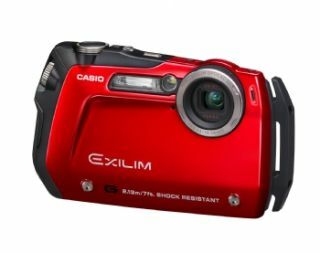 Casio has done what some thought impossible and made a ruggedised camera which you wouldn't mind lugging around. The Casio EX-G1 is the thinnest rugged camera on the market, offering both style and substance for those who want to take shots while in the danger zone. The camera is able to withstand being dropped, as long as the fall is under seven foot, and is waterproof to a depth of three metres. Size-wise the camera is just 19.9mm thick and it comes packing a 12.1MP sensor, 3x optical zoom and a 2.5-inch LCD screen to view back your death-defying shots. As well as being hard as nails, the camera has decent battery life too – offering up to 300 shots before it needs a recharge. While internal memory is a measly 35.7MB, the camera does have the usual microSD card slot. The Casio EX-G1 has a release date of later this month, will come in either red and black, and cost £279. Go to www.casio.co.uk for more details.